Υπάρχουν 2 τρόποι για να συνδεθείτε στο Ελληνικό Δωμάτιο Συζητήσεων #HELLAS... Πρώτον μέσω του internet Explorer ή μέσω του MIRC. 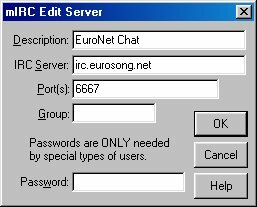 There are two ways to enter to the Greek Eurovision Chat Room.... First you can join in #hellas throught internet explorer and the second way is to join by using the MIRC programme. 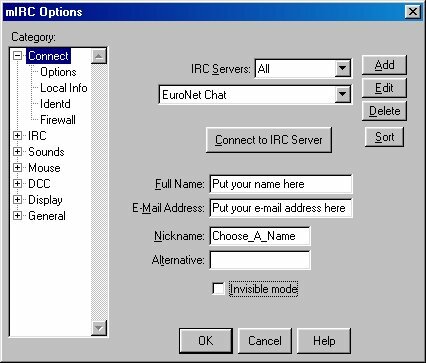 EuroNet Chat may be accessed using any IRC (Internet Relay Chat) software, independently of the web browser. If you don't have IRC, you can download it for free from the web. I recommend mIRC. Click on the logo on the left to open a window with dowload locations. Type the information into the fields exactly as it is pictured above. There is no "Group" required, and "Password" is unnecessary unless your nickname is registered. Click "OK" and the EuroNet Chat server should now appear in the list, as in the top diagram. Now fill in your details - name, e-mail address and Chat Nickname and click "Connect to IRC server". Type "#hellas" into the top line, then click the button to the right: "Add" to add it to the list. 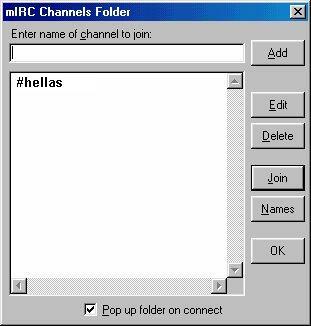 If you are using mIRC for the first time, there will probably be a whole load of channels already listed which you don't need - I recommend you go through these, deleting them to clear up the space so you only have #hellas there, as pictured above. Now all you have to do is to double-click #hellas in the list every time you connect.